Messier 90 (M90) is a spiral galaxy located in the constellation Virgo. It is a member of the Virgo Cluster. M90 lies at a distance of 58.7 million light years from Earth and has an apparent magnitude of 10.26. Its designation in the New General Catalogue is NGC 4569. 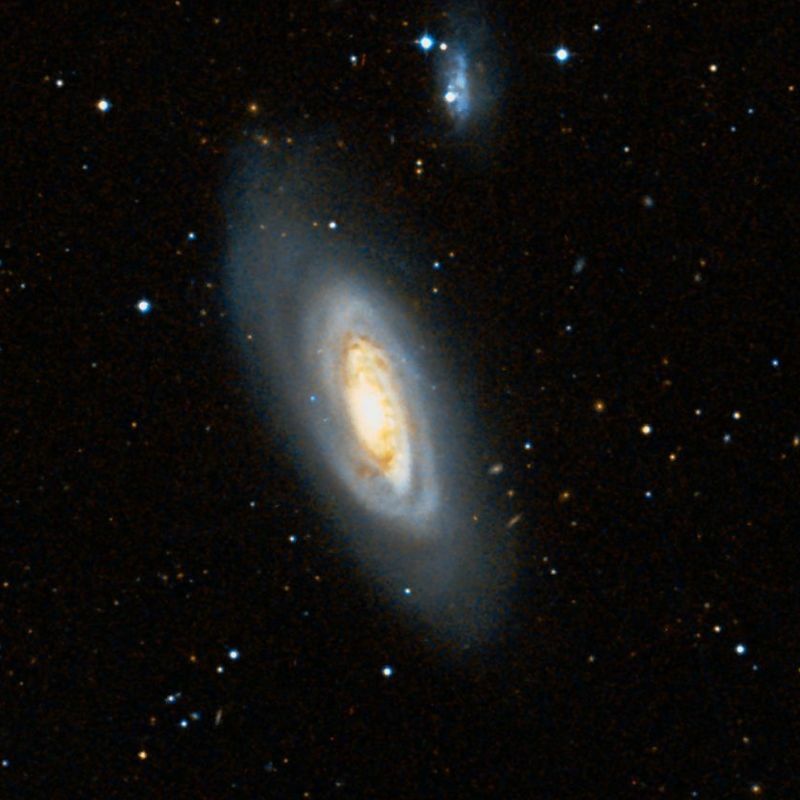 With an apparent size of 9.5 by 4.4 arc minutes and a linear diameter of 165,000 light years, M90 is one of the larger spiral galaxies in the Virgo Cluster. It can be seen in 10×50 binoculars under exceptionally good conditions. In small telescopes, it appears as a bright, oval-shaped patch of light. 8-inch telescopes reveal the galaxy’s bright core surrounded by a patch of nebulosity. 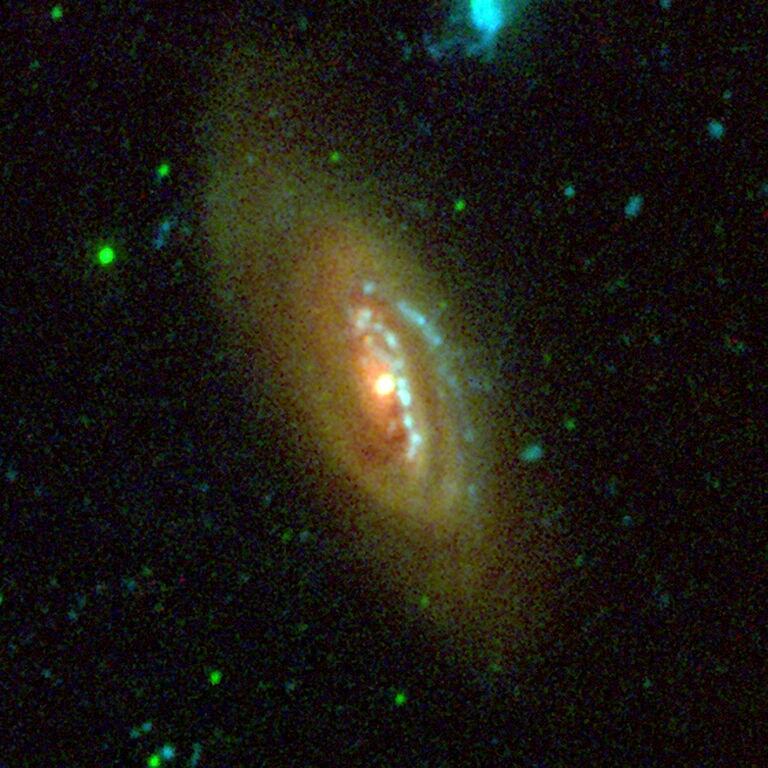 The spiral structure can be seen in large amateur telescopes. Messier 90 is located about 1.5 degrees from the Virgo Cluster subgroup centred on Messier 87, right on the border with the constellation Coma Berenices, near the centre of the Virgo Cluster. 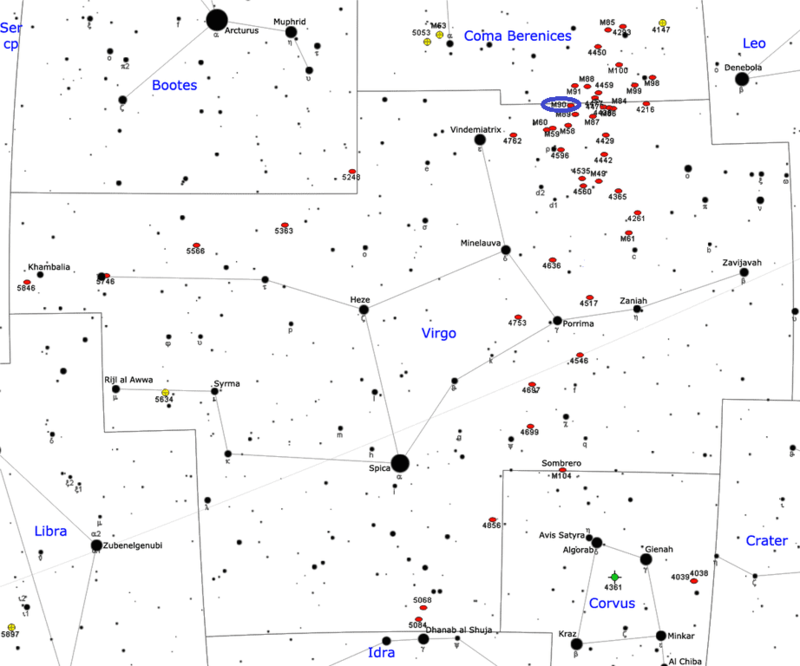 The centre is positioned roughly halfway between the bright stars Denebola in Leo and Vindemiatrix in Virgo. M90 can be found 1.5 degrees to the northeast of M87. Several other Messier galaxies can be found in the same region of the sky. The elliptical galaxy M89 lies 0.75 degrees southwest of M90, the barred spiral galaxy M91 is located about a degree north-northwest of M90, and the spiral galaxy M88 lies 1.5 degrees to the northwest of M90. 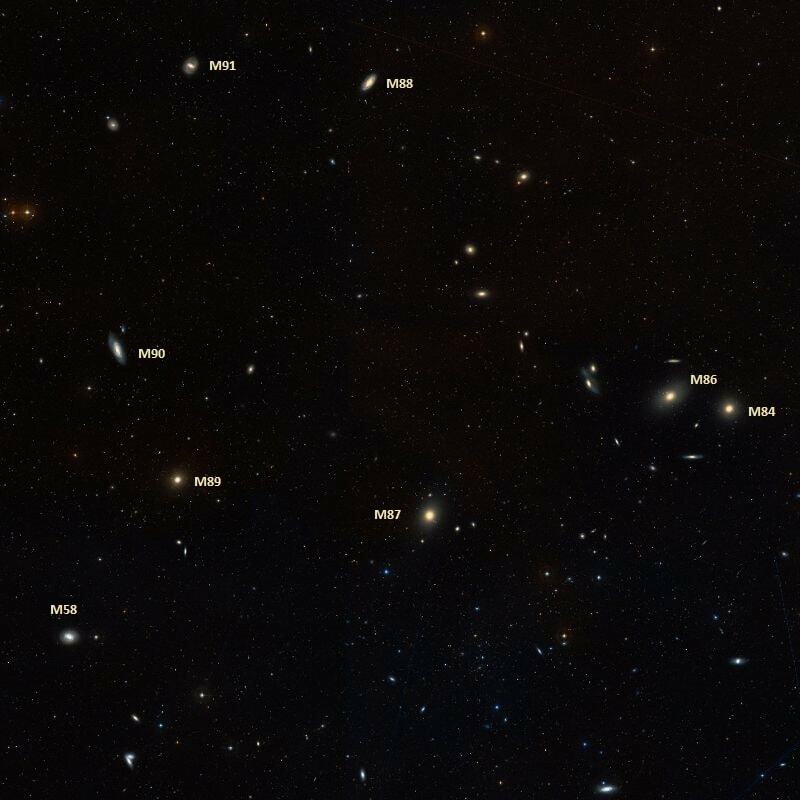 The best time of year to observe the galaxies in the Virgo Cluster is during the spring. Messier 90 is one of the largest and brightest spirals in the Virgo Cluster. The galaxy has an absolute magnitude of -22, which makes it intrinsically brighter than Andromeda (M31). Its tightly wound spiral arms do not show any signs of star formation, except in regions near the darker dust lanes in the inner part of the galaxy’s disk. 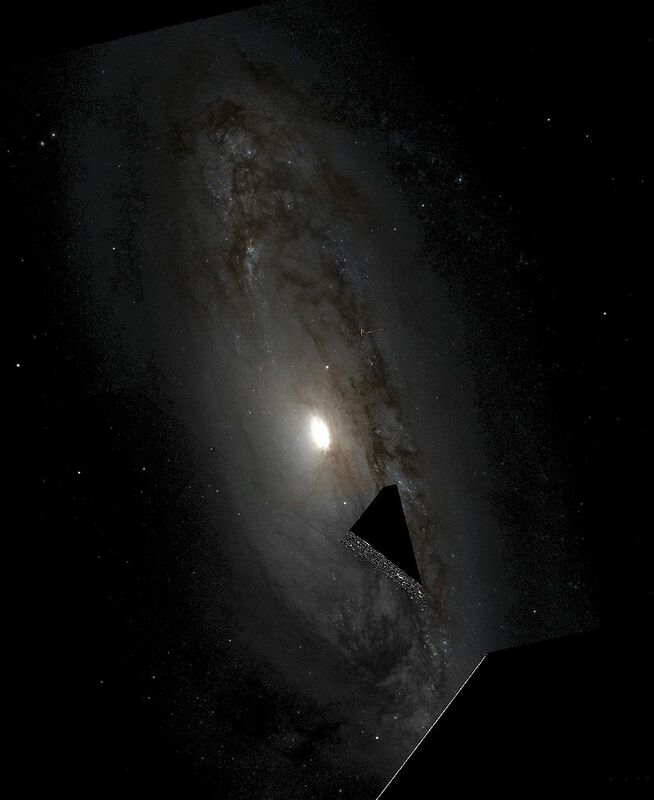 James D. Wray has suggested that M90 is on its way to becoming similar to Messier 64 (Black Eye Galaxy) before it evolves into a lenticular (S0) galaxy. Messier 90. Based on observations made with the NASA/ESA Hubble Space Telescope, and obtained from the Hubble Legacy Archive, which is a collaboration between the Space Telescope Science Institute (STScI/NASA), the Space Telescope European Coordinating Facility (ST-ECF/ESA) and the Canadian Astronomy Data Centre (CADC/NRC/CSA). Messier 90 is a blueshifted galaxy, one moving in our direction, in contrast to most other galaxies, which are redshifted and moving away. M90 is moving toward us at a velocity of up to 383 km/s. The only Messier galaxy approaching us at a higher velocity than M90 is M86, which may be moving at up to 419 km/s relative to us. M90 is likely moving through the Virgo Cluster at an exceptionally high velocity, at almost 1,500 km/s. The galaxy may be in the process of escaping the cluster. Messier 90 contains an estimated trillion stars and a rich population of globular clusters. The galaxy is home to an estimated 1,000 globulars. Messier 90 is believed to be interacting with a satellite galaxy, IC 3583, classified as an irregular galaxy. Messier 90 has lost much of its interstellar medium as a result of interaction with the intracluster medium. The galaxy is very poor in gas compared to other spirals because it is experiencing ram-pressure stripping as it moves through the Virgo Cluster. The process is stripping the galaxy of interstellar dust and gas. The star forming regions in M90 are considerably more truncated than those in similar galaxies outside the cluster. Some of the H II regions are even found outside the galactic plane. Up to 105 supernovae in the galaxy’s core have produced superwinds that are responsible for expelling the interstellar medium from the galaxy to the intracluster medium. The spiral arms of M90 appear featureless, not dotted with star forming regions like other spiral galaxies. For this reason, M90 is classified as an anemic galaxy and serves as a prototype for this class of galaxies. The central region of M90 does have significant star forming activity occurring, with a number of young O and B-type stars that formed about 5 to 6 million years ago. These stars are surrounded by white A-type supergiants that formed in a burst about 15 to 30 million years ago. This image from NASA’s Galaxy Evolution Explorer shows the galaxy NGC 4569, located about four million light-years away in the constellation Virgo. It is one of the largest and brightest spiral galaxies found in the Virgo cluster of galaxies, the nearest major galaxy cluster to our Milky Way galaxy. Blue represents ultraviolet light captured by the telescope’s long-wavelength detector. Green shows ultraviolet light from the short-wavelength detector, and red shows red visible light from the Palomar 1.5-meter telescope, near San Diego. The 14th magnitude companion, IC 3583, which can be seen in the same field of view as M90, is about 40,000 light years in diameter and appears slightly distorted. The smaller galaxy is receding from us at about 1,120 km/s. As the galaxies’ recessional velocities are very different, the two are not likely to stay companions, if that is what they really are now.